After a particularly "unusual" and stressful week chock full 'o crud weather and testy problems, I find myself with a free day on Saturday and having not seen my beautiful bride nearly all week, she comes home from the "not unusual" 60-hour work week on Friday night to inform me that "Spaulding- Get Dresssed- we're going Musky Fishing" tomorrow... Okee-dokee. I roll outta the warmth at 4:30, make the obligatory pot of Kona and roust her at 5-bells. We dress, drink coffee, hook up the Alumacraft and head for the Chain. She was very excited for my success out there with a client last Saturday but envious too. We hit the water on Catherine at 06:30 and start burnin' bucktails- her with the black/white that did so well for me last weekend, me with a perch color. Air temp 53, water 54, a bit murkier than last week due to the rain but not bad, and winds WNW at 5-10. Barometer dropping at 29.80. Spot #1- nada. Spot #2... I tell her "This is where we got the 35.5" fish last Saturday" and after 3-4 casts in that spot she grunts "GOT 'EM" from the back of the boat through gritted teeth. I look up to see her tied to a good musky about 25 yards out. I reel in fast- run for the net. She does a good job- gets the fish to the boat- it runs again- gives an awesome swirl- runs to the motor (they will find ANY obstruction they can)- she clears her- says "She's not hooked very well" and as soon as she says it-from her lips to God's ears- the fish gives a good head-shake, and she's gone. Had her on about 45-60 seconds. Good fish- 37" or so and Mrs. is happy- knee shaking happy. We high-five- she says "That felt almost as good as..... " (you finish the rest) and we carry on. All we see at spot #2. On to Spot #3. I had high hopes here. Nobody on the spot (in fact- not many boats out at all today) and we fish it thoroughly, slowly, methodically- and I see only one fish (smaller- maybe 30-32") come up to check out my bucktail but it's gone as fast as it came in. On to spot #3. This spot we've worked so many times... we've raised so many fish here- and have never caught one of 'em. But we know it's a good spot- it holds fish. We work it slowly and according to plan.. shallow to deep-around the bend like we always do. Off the tip of the best possible ambush point- a spot we've cast to maybe a hundred times over the past 3-4 years... today- the fish is there. My bucktail hits the water- two- maybe three turns of the of the blades- WHACK and I'm hooked up- a hard strike at that. I work 'em in, Mrs. does a great job with the net- and the bucktail pops free just as we get him safely in the net - a decent 35". Not huge, but respectable and good looking and gives his all! V was so excited she sat on the gunnel and shed tears for a minute- it was cute as all get-out. I look at her- turn my hat sideways- we giggle like little kids and I tell her "Can't top that- let's get outta here and I'll buy ya lunch" and she agrees with a grin and a kiss. I don't know what's liable to happen next... but will report it here when it does. holy cow, what a trip. Congrats veronica, and congrats on the netting job, I would have thrown you in if you blew it too But man, what an awesome story, I have heard of muskies doing this, but never getting em in the boat too! Congrats again on the trip, and it sounds lik ea blast. BTW did you guys check the record for the light tackle? It may be worth it. Just for kicks. What a great story Todd! Congrats V.
No one is gonna top that one this weekend... Congrats to the both of you, Great Story Todd! That's just about the best darn fish tale I ever did read. Better send a copy to the Mormishka folks Todd and say congrats to the Master! Now what happened to that photo of your perch. Great read T and V.
Awesome job by both of you. You all are the coolest! Just havin' a ball let me tell ya. Averages work out- over time, the Gods smile. I was starting to lose some faith before the past couple weeks. Will keep after 'em for a bit yet and let ya know how it goes (may even sneak in a couple hours late today). I actually had that happen to me a couple years back when fishing for crappie with my 8 year old daughter. I wrote a story about it as a way for my kiddo to remember it and Bob Maciulis was nice enough to print it in the Outdoor Notebook. 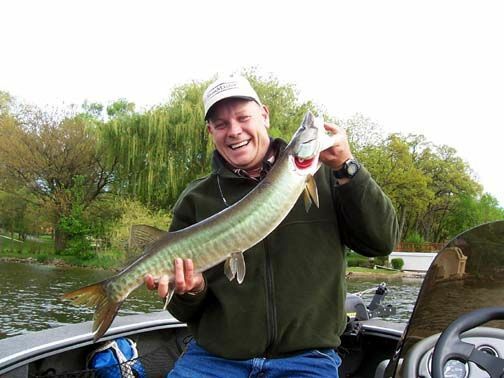 A friend of mine who also posts on this site, Bill A., host a website, catchphotorelease.com, and he has the article up there with a picture of the muskie we landed together. Great story. Congrats on an amazing catch. Chitown-Angler was started on February 10, 2003 and has received 207550307 page views in total since that date.